The Dance of the Sugar Plum Fairy is one of ballet’s most celebrated tunes, played on and off stages across the world. For any ballerina to dance to this iconic piece is, as Royal Ballet first soloist Yasmine Naghdi puts it, “one of the great roles a ballerina dreams of dancing while training as a student”. 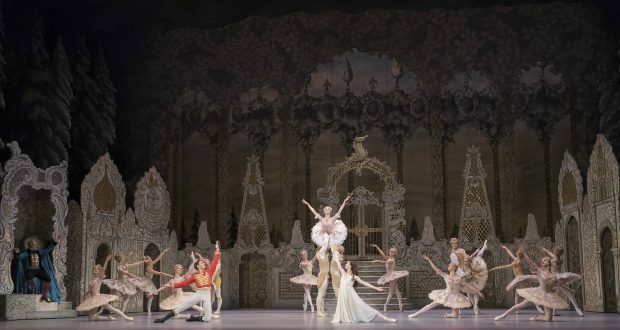 Audiences yearn to see The Nutcracker, the ballet in which the Sugar Plum Fairy has her home, as much as ballerinas wish to perform the role of the Sugar Plum. Many would argue that Christmas just is not Christmas without this festive favourite. This year the Royal Ballet dedicates its performances of The Nutcracker to Sir Peter Wright – the choreographer of this acclaimed production. This celebratory year sees several young dancers making their débuts as the Sugar Plum Fairy and her Prince. For many of them, The Nutcracker is a production they have been involved with for as long as they can remember. “All dancers have been involved in The Nutcracker forever. It’s part of our mental calendar. When the leaves start falling, you know it’s that time,” said Beatriz Stix-Brunell, a recently promoted first soloist. “I have been coached by Lesley Collier everyday. She was the first Sugar Plum I saw – on the same DVD – and I am still in awe of her. Anthony Dowell, her Prince in the recording, has also come to coach me and Alexander Campbell – my Sugar Plum Prince. To have them watching me dance this pas de deux, as opposed to the other way round, was a very surreal moment,” she gushed. First soloist Claire Calvert shares many of the same sentiments as her colleagues, having been involved in the ballet since she studied at the Royal Ballet School from the age of 11 – performing every role from the Gingerbread Man and party child, to a snowflake and the Rose Fairy. The Sugar Plum Fairy lives with her Prince in the Kingdom of the Sweets, in which the ballet’s second act is set, and while the sum of their dancing is just about 10 minutes, preparing to perform this role takes weeks upon weeks to perfect. The distinct tone of the Sugar Plum’s variation is brought about by the celesta (a musical instrument) used in its composition. This instrument has come to be associated with magic and is also a primary component of the popular Harry Potter melody – Hedwig’s Theme. However, the fine choreography that accompanies the celesta’s delicate sound and the illustrious pas de deux is harder to perform than the dancers let show on stage. “It’s a role that requires strong technique along with that sugary performance on top,” said Claire. The Sugar Plum though is nothing without her Prince, and while his music is less known, being a stable partner during the tricky pas de deux proves to have its own challenges. Nicol Edmonds, a soloist with the company, makes his début as Beatriz’s Prince later this month and shared some of the reasons why the Sugar Plum Pas is harder than it appears. “It’s a challenge because of all the weight changes. The ballerina is often in an open position on one leg, often in a cambré (backbend), and then I have to get her back on both legs in fifth position. “That said though, I love chucking Beatriz in the air in the pas de chat section! The music builds so much in that section that you get such a rush,” he enthuses. Teaching and coaching of upcoming repertoire is done by ballet masters and mistresses at the Opera House – many of them former dancers with the company – but often guest coaches are snatched up. The dancers described their experiences working with one of their coaches in particular – Strictly Come Dancing judge, Darcey Bussell. “It’s wonderful getting to work with someone new that can get a fresh look on you and your technique and performance. Darcey is a huge inspiration to me,” Claire said of the former Royal Ballet Principal. “Darcey is such an icon, so I try to take as much as I can from her – her eye to detail is extraordinary. I still get a little starry eyed sometimes, she’s just fabulous!” laughed Nicol. And while they all must perform the same movements as the other Sugar Plums and Princes, they each hope to be able to stamp the role with their own trademark. Claire promises to showcase all she has learnt through her career with the Royal Ballet so far. Yasmine hopes for her Sugar Plum to be regal and strong, Francesca’s warm and charming. Beatriz and Nicol wish their characters to be kind and honest, and hope their energetic, friendly offstage rapport will come across on stage. While tickets are currently sold out for this season’s performances of The Nutcracker, an ample supply will become available nearer to the times of the highly anticipated débuts of these rising talents – scheduled to take place between Christmas Eve and New Year’s Eve. Very well written! I wish I was there to see it and imagine myself in those dancers’ shoes.